This is my first time out trying a recipe from Trisha Yearwood’s Food Network show. The country music star focuses on rib-stickin’ Southern home cooking. In the opening credits she says that everything’s home-cooked, but her recipes actually tend toward semi-homemade. 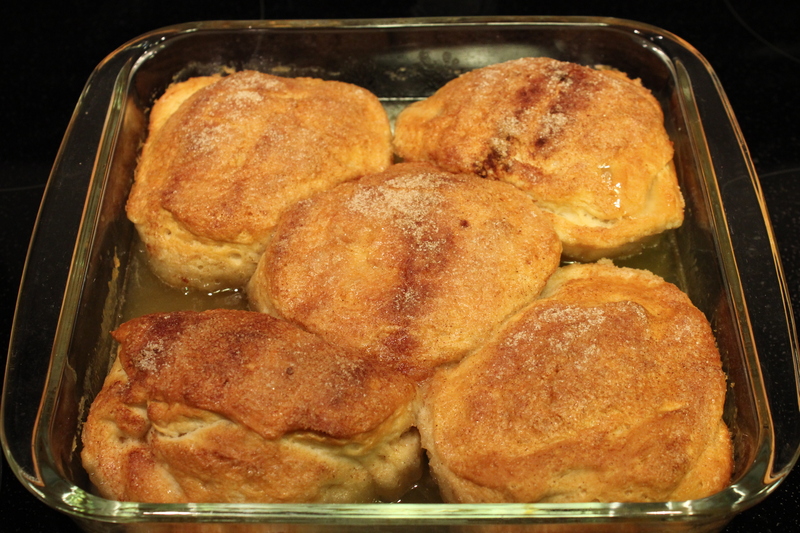 Example: these apple dumplings, which use store-bought buttermilk biscuit dough for the pastry. Although I’m not opposed to store-bought shortcuts, I felt a little misled. One reason I tend to stay away from using Pillsbury-type doughs (with the exception of the pie crusts) is that they’re best eaten straight from the oven. Wait an hour or so and they’ve usually already hardened, amplifying their fake buttery taste. That, and I wince when the can pops. 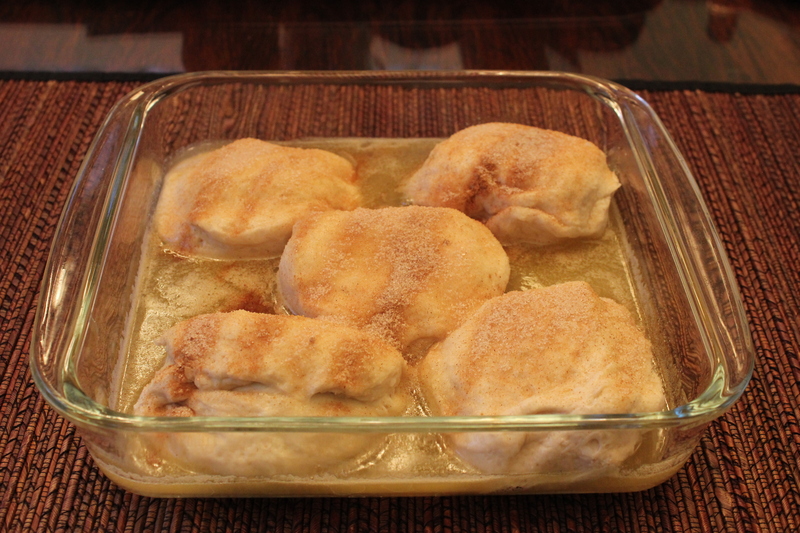 Before these semi-homemade apple dumplings went into the oven, they were languishing in a buttery bath. I decided to try this recipe anyway, swayed by the overwhelmingly positive reader reviews. But a few questions plagued me. Would the pastry soaking in the butter fluids actually cook, or remain factory-made pastry mush? Would the fake-butter taste from the pastry overwhelm the finished product? I’m relieved to report that these turned out quite tasty, despite the slightly repulsive butter bath they baked in (I just about halved the recipe for 8 dumplings). The Granny Smith apple softens inside, a nice contrast to the crunchy cinnamon-dusted tops. The leftovers even held up the next day (stored without the butter sauce). After baking. The bottoms do bake through, thankfully. PS: Turns out Tricia’s in good company when it comes to semi-homemade apple dumplings. Pioneer Woman makes a variation on these using Crescent Roll dough and Mountain Dew (recipe here), if you like your apple dumplings with a caffeine kick.